Roundup Turbo is a unique soluble herbicide formulation of glyphosate (450 g/l glyphosate) containing 25% more active ingredient than the standard Roundup 360 formulation. It is a non-selective weedkiller with nonresidual effects. This provides benefits to growers in the form of reduced storage and packaging waste. 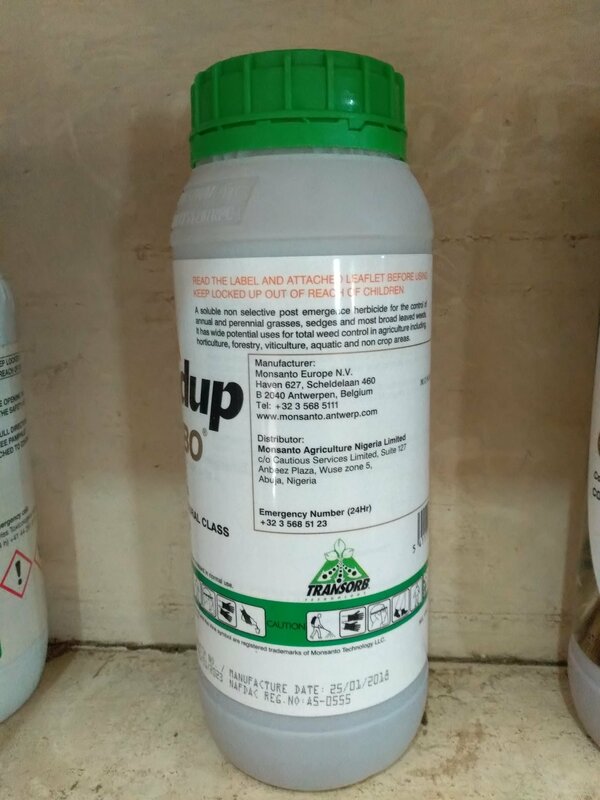 Roundup Turbo is a non-volatile, water-soluble liquid product with non-selective herbicidal activity against early weeds (annual and perennial broad-leaf weeds and grasses). It’s formulation features sophisticated and efficient surfactant system which is tissue safe, optimized for dissolution in water and waxy materials, accelerates the uptake of a larger quantity of the active ingredient by weeds with faster penetration into weed cuticles to roots. It is an efficient crop protection product with excellent weed control, reliability and favorable environmental attributes. It is applicable in low volume- low-pressure pre-plant spraying systems (emergence of first weed prior to planting). Roundup Turbo has unrivaled efficacy, even on the toughest weeds and in weather conditions where inferior formulations fail to perform. Its low spray volume (70-100 per ha) results in increased hectares sprayed with increased concentration of active ingredient, time-saving and more productive utilization of labor and equipment. Highest levels of long-term weed control. Greater consistency in a wider range of weather conditions. Powerful formulation with 25% more glyphosate per liter. Less packaging, handling, and waste than other herbicide formulations. Symptoms develop more quickly allowing cultivation intervals to be reduced. 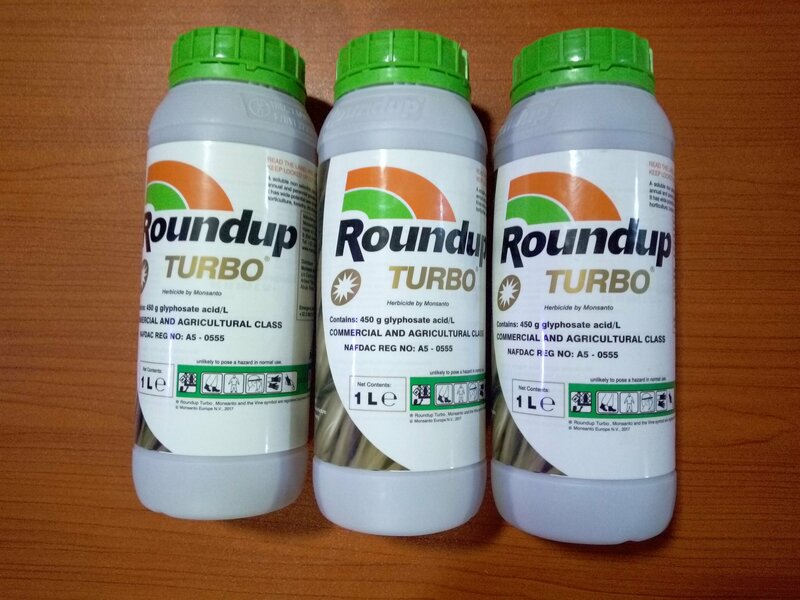 Roundup Turbo is compatible with a wide range of other products. The application is based on low volume-low pressure principle which results in reduced risk of non-target crop injury on contact with herbicide. After tilling, early weeds are allowed to emerge, then Roundup Turbo is sprayed at recommended dosage rate after the emergence of first weed. Crops can be planted 24 hours after spraying (active ingredient would have been taken up by the weeds). Knapsack spraying: 1000sq m per 20L. Ground spraying equipment: 70-150L spray solution per ha at low pressure. Not to be sprayed in windy conditions (above 15km/hr). Do not allow spray mist drift unto desirable vegetation. Use slightly alkaline water with buffer (ammonium sulfate) to dissolve. Spray actively growing weeds before planting (increases absorption at a lower rate). Control of early weeds (annual and perennial broad-leaf weeds and grasses).